Contrary to what has been written so far in the mainstream media, Admiral William Fallon was not removed because he was opposing President Bush on an attack against Iran. He resigned from his own initiative after the agreement he had negotiated and concluded with Tehran, Moscow and Peking was sabotaged by the White House. This decision by the Bush administration will provoke renewed fighting in Iraq and exposes gravely the GI’s to a new Resistance this time supported without restraints from the outside. It was nearly 22h GMT, on Tuesday March 11th 2008 when commander in chief of Central Command, Admiral William Fallon announced from Iraq that he was presenting his resignation. Immediately afterwards in Washington, Secretary of Defense Robert Gates, and also his friend, declared, in an improvised press conference that he accepted that decision with regrets. In fact, the resignation of the admiral was apparently demanded by the White House following the publication of an article in the monthly Esquire  reporting “frank” comments of the officer concerning President Bush. In the same article one could read that the removing of the Admiral would be the last signal before the war. Yet this interpretation is erroneous. It ignores the evolution of the equilibrium of forces in Washington. To understand what is at stake, let us go back a little bit. Our readers, which have been regularly informed in our columns of the ongoing debates in Washington, will remember Fallon’s threats to resign , the mutiny of high level officers , the inside story of Annapolis , and the infiltration of NATO in Lebanon  which we reported in our columns before everybody else; revelations which were contested when first published and which later well fully confirmed. We add here unpublished information on the negotiations conducted by Fallon. The Fallon plan While the United States establishment had approved going to war against Iraq hoping to gain substantial economic profits, progressively it lost all such illusions. The direct and indirect costs generated by this operation are beyond measure and only profits to a very few. Since 2006, the ruling class, worried, decided to bring this adventure to an end. It contested the over-deployment of soldiers, the increasing diplomatic isolation and the financial hemorrhage This opposition expressed itself through the Baker/Hamilton report which condemned the US plan for a Greater Middle East and proposed a military withdrawal from Iraq and a diplomatic rapprochement with Teheran and Damas. Under this amiable pressure, President Bush was forced to fire Donald Rumsfeld and replace him with Robert Gates (member himself of the Baker/Hamilton commission). A bi partisan work group – the Armitage-Nye commission – was created to define consensually a new policy. But it turned out that the Bush/Cheney tandem had not renounced its projects and used this group to allay its rivals while at the same time continuing to wield its weapons against Iran. Cutting short those maneuvers Robert Gates gave carte blanche to a group of high level officers he had frequented in the times of Bush father. On December 3rd 2007, they published a secret services report discrediting the White House lies concerning the so called Iranian threat. Beyond, they tried to impose on President Bush a rebalancing of his Middle East policy, to the detriment of Israel. 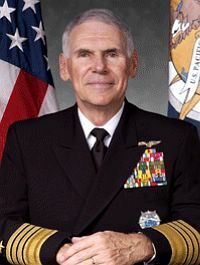 Admiral William Fallon exerts a moral authority over that group which includes Mike McConnell (National Director of Intelligence), general Michael Hyden (CIA director), general George Casey (chief of staff of the lad army), and later Mike Mullen (head of the joints chief of staff). Cold blooded, and gifted with brilliant intelligence, he is one of the last great bosses of the armed forces to have served in Vietnam. Worried by the multiplication of operation theatres, by the dispersion of forces and the usury of troops, he openly contested a civilian leadership whose policies can only lead the US to defeat. In the continuation of that mutiny, that group of high level officers was authorized to negotiate an honorable end to the crisis with Iran and to prepare the withdrawal from Iraq. According to our sources, they conceived an agreement in three phases: the US would have had the Security council to adopt a last resolution against Iran in order not to lose face. But this resolution would be empty and Teheran would accommodate to it. Mahmoud Ahmadinejad would go to Iraq where he would reaffirm the regional interests of Iran. But that trip would be purely symbolic and Washington would accommodate to it. Teheran would use all its influence to normalize the situation in Iraq, and to lead the groups of the armed resistance it supports towards political integration. This stabilization would allow the Pentagon to withdraw its troops without defeat. In exchange, Washington would cease its support to armed groups of the Iranian opposition, in particular the Moudjahedine of the people. Still according to our sources, Robert Gates and that group of officers, lead by General Brent Scowcroft (former National Security Adviser), solicited support from Russia and China for this process. In perplexity, before responding positively, Moscow and Peking first confirmed with the White House its forced agreement (to this process, noe), relieved to be able to avoid an uncontrollable conflict. Vladimir Putin engaged himself not to seek advantage militarily from the US withdrawal, but demanded that the political consequences be drawn. I was agreed upon then that the Annapolis conference would lead to symbolic results, while a large conference on the Middle East would be organized in Moscow to unblock all the dossiers that the Bush administration had been poisoning. The same Putin accepted to facilitate the Iran-US compromise, but worried about a too strong Iran on its Russian borders. As guarantee, it was agreed upon that Iran would accept what it had always refused so far: not to fabricate alone its nuclear fuel. Negotiations with Hu Jintao were more complex, the Chinese leaders being shocked to discover to what extent the Bush administration had lied a propos the so called Iranian threat. So, first, bilateral trust had to be re-established. Luckily Admiral Fallon who until recently commanded the PacCOM (pacific zone), had kept courtesy relations with the Chinese. It was decided that Peking would let a formal anti-Iranian resolution pass at the Security Council but that the formulation of that text would in no way hinder the Sino Iranian trade. The sabotage At first glance, all seemed to function. Moscow and Peking accepted to play roles at Annapolis and to vote resolution 1803 against Iran, while president Ahmadinejad savored his official visit to Baghdad where he secretly met US heads of the Joint Chiefs of Staff, Mike Mullen, to plan reduction of tensions in Iraq. But the Bush/Cheney tandem did not declare itself defeated. It sabotaged as soon as it could this well oiled mechanic. Firstly, the Moscow conference disappeared in the moving sands of oriental mirages, before even having existed. Secondly, Israel launched its assault against Gaza and NATO deployed its fleet off the coast of Lebanon as a means to provoke the setting on fire of the Greater Middle East region, while Fallon was attempting to put out the fires one by one. Thirdly, the White House, usually so prompt to fire its own employees, refused to dump the People’s Mouhadjidines. Exasperated, the Russians massed their fleet south of Cyprus to survey the NATO ships and send Sergei Lavrov on tour to the Middle East with mission to arm Syria, Hamas and the Hezbollah to reestablish the equilibrium in Levant. While the Iranians, furious of having been cheated, encouraged the Iraqi resistance to break the GIs. Seeing his efforts reduced to nothing, Admiral Fallon resigned as the only means for him to save his honor and his credibility vis a vis his interlocutors. The Esquire interview, published two weeks, ago is only a pretext here. The hour of truth In the next three weeks, the Bush/Cheney tandem will play all its cards in Iraq in an attempt to have weapons determine the outcome of the situation. General David Petraeus, will push to the extreme his counterinsurgency program in order to be able to come up to the next US congress, beginning Aprils, as victorious. Simultaneously, the Iraqi resistance, now supported by Teheran, Moscow and Peking, will multiply its ambushes and seek to kill a maximum occupiers. It will then be up to the US establishment to draw the conclusions of the situation in the battle field. Either the Petraeus’ results on the ground will be deemed acceptable and the Bush/Cheney tandem will finish its mandate without further difficulties. Or, to avoid the spectrum of defeat, it will have to condemn the White House and restart in one way or the other, the negotiations that Admiral Fallon had carried out. Simultaneously, Ehud Olmert will interrupt the negotiations started with Hamas via Egypt. He will heat up the region up to Bush’s visit in May. This regional fever should stimulate the Bush apparatus, either through investments in the military-industrial domain of the Carlyle fund, whose real estate branch is on the verge of bankruptcy, or via the electoral campaign of Mc Cain. Thierry Meyssan, Journalist and best-selling author is president of the Paris based Voltaire Network. « The Man Between War and Peace » par Thomas P.M. Barnett, Esquire, mars 2008. « The Neoconservative Agenda to Sacrifice the Fifth Fleet – The New Pearl Harbor », by Michael Salla, Voltaire Network, 19 november 2007. « La ‘solution à deux États’ sera bien celle de l’apartheid », par Thierry Meyssan, Réseau Voltaire, 13 janvier 2008. « La discrète arrivée de l’OTAN au Liban », par Thierry Meyssan, Réseau Voltaire, 10 mars 2008.